The city’s $3 billion plan to recycle wastewater into drinking water took another step forward Wednesday when the San Diego Regional Water Quality Control Board approved a modified permit for the Point Loma Wastewater Treatment Plant. City officials contend their “Pure Water” program will provide a sustainable source of potable water for a growing city with a dry climate. Backers estimate that recycling — purifying wastewater and mixing it in reservoirs with water from traditional sources — will account for one-third of the area’s supply by 2035. The plan, approved by the City Council last October, offers the side effect of reducing discharges from the water treatment plant, which enabled the water board to issue the modified permit. Otherwise, the city would have had to spend around $1.8 billion to upgrade the plant to meet federal standards. 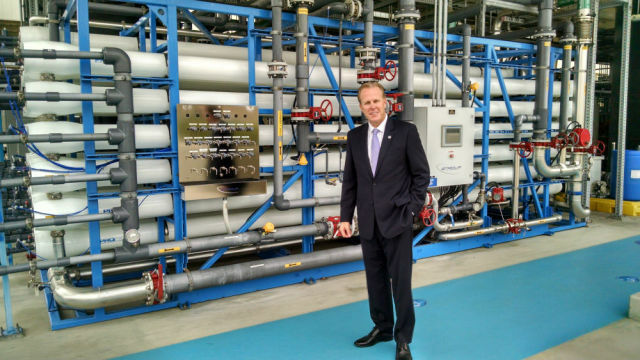 “Our plan to create a sustainable, local water supply through water purification will protect our ocean and help San Diego continue to meet clean water standards,” Mayor Kevin Faulconer said. City officials aim to begin delivering 30 million gallons of recycled water a day within five years. The final step in the regulatory process is expected to come next month before the California Coastal Commission.